White-bellied Cuckoo-shrikes are more plentiful in Queensland and northern Australia, but the southern subspecies 'robusta', once known as Little Cuckoo-shrike, does occur sparingly in forested areas of NSW and Victoria, just occasionally reaching southeast S.A. 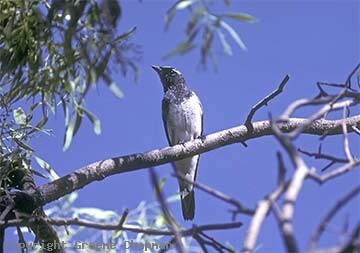 The subspecies 'robusta' occurs in two morphs - the more common one just a slightly greyer version of birds from Queensland and northern Australia (see pic.425205) and a darker, more blackish form (see pic. 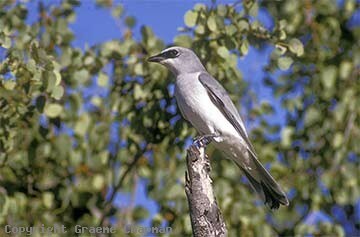 423203) which can be confused with a Black-faced Cuckoo-shrike. White-bellied Cuckoo-shrikes are mainly observed singly or in pairs quietly feeding amongst the tree canopies, usually quite high up but occasionally down in the shrub layer where suitable food is available. They feed mainly on arthropods but fruit, seeds and nectar are also taken. Their presence is usually only first detected by their very distinctive call, resembling "kiseek...kiseek" (listen on sound page). In many areas, particularly in the north, they are regarded as resident, living as pairs in a permanent territory and no large scale movements or migration are known - occasionally up to a dozen or so may be seen together. 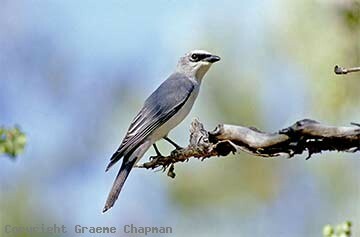 Their seasonal movements are not well understood but in much of NSW they are regarded as a summer visitor. 425203 ... 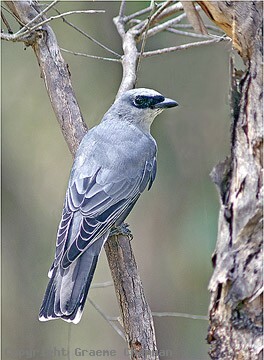 Dark form of Little Cuckoo-Shrike, photographed near Charleville,Qld.